In a recent blog in which we looked at access control and security trends to expect in the near future, one of the topics we looked at was mobile access control. And while mobile access control is still a long way from being a major player in the world of access control, it’s becoming more popular everyday. This week, we’ll take a look at the new HID Mobile Access solution that was introduced last fall at the ASIS International Annual Seminar and Exhibits, and how it leverages mobile access to provide end-users with an easy-to-use and highly effective access control solution. HID Mobile Access is designed to allow users with Bluetooth Smart and NFC-enabled smartphones and other mobile devices to open doors and gates with their phone. The user downloads an app to their phone and is granted permission for access control from an administrator. The user can then either (a) hold their phone up to a compatible reader, or (b) from a distance, make a twisting motion with their device while pointing it at the reader, either of which will unlock the door or gate. The second option is a patented “Twist and Go” gesture technology. This mobile access solution allows users to essentially bring their own device for access control purposes. On the user’s side, all that is needed is for the user to download an app and receive permissions from an adminstrator. There is no need for access control cards or PIN numbers, which can be lost, forgotten, or in the case of a card, stolen. Mobile phones provide an extra layer of security as even if the phone were stolen, it would have to be unlocked first in order to access the access control app. 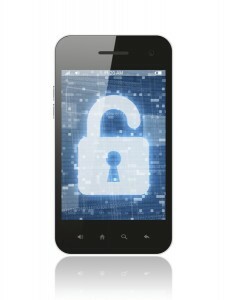 HID Mobile Access uses the company’s Seos technology, which bolsters security by turning devices into trusted credentials, as well as using end-to-end encryption for unique transactions involves the issue, delivery, and revoking of Mobile IDs. This protects users’ person identification data, a fact which will instill confidence in end-users. HID Mobile Access is used with the company’s mobile-enabled iCLASS SE® and/or multiCLASS SE® readers, and includes Mobile IDs, HID Mobile Access Apps and access to the HID Secure Identity Services™ portal for managing users and issuing or revoking Mobile IDs. The mobile-enabled readers are also interoperable with 125 kHz HID Prox and high-frequency technologies including iCLASS Seos®, iCLASS SE, standard iCLASS®, MIFARE®, and MIFARE® DESFire® EV1, which optimizes flexibility for using both cards and mobile devices. This entry was posted on Thursday, January 22nd, 2015 at 2:33 pm. Both comments and pings are currently closed.